The review you’ve all been waiting for! We have cycled more than 8500 kilometers with the Pinion P1.18 Gearbox, so I guess it’s time to publish our user review now. We’ve received quite a few emails of curious people, so here it is. Keep reading to find out how we experienced the Pinion Gearbox! Soon after jumping on our Pinion bikes we were forming our opinion on this gear system. But in order to write a reliable review, we wanted to put the P1.18 to the test and cycle at least 7500 kilometers with it. Unpaved, paved, rocky, sandy, muddy, wet, dry, hot and cold, the Pinion has been there with us. And how did it perform and how is it still performing? Being former Porsche gearbox engineers, the guys at Pinion have the ambition to develop top products for the best bicycles on the market. They have been on the market since 2011 and are revolutionizing bicycle transmission in the form of their Pinion Gearbox. Apart from the P1.18 we were able to test, the Pinion family includes three other gearboxes: the P1.12 for mountain biking and bicycle touring, the 9 speed P1.9 XR for e-bikes and the P1.9 CR engineered particularly for urban bikes. All their transmissions are 100% “Made in Germany”. The name and number of the gearboxes correspond to the amount of gears, in our case 18 gears. What is the Pinion Gearbox exactly? The Pinion box is an enclosed unit with seals between the housing parts, which prevent water and dirt from affecting the transmission. The complete transmission consists of two consecutive sub-transmissions with 6×3 gears. This is multiplied to yield 18 gears. Due to the sealing system the box cannot leak any oil. The box itself is located at the position of the crankset, which means that you need a specially designed frame in which the box fits to be bolted with six bolts. The 18 gears are evenly spaced with an 11.5% increase per gear. The box itself weighs 2698 gram and makes you about 800-900 EUR lighter (compared to same Santos bike with Rohloff). Those are the facts, but I’m sure you also want to know if we did notice any difference in riding behaviour? And yes, we did. First of all, we felt no resistance in any of the gears and with that the gearbox is very silent and smooth. And secondly, the steps are smaller between gears and therefor there’s always a right gear for you; uphill or cruising on the flats. As we’ve mentioned in the beginning of this post we’ve put the gearbox to the test for about 8500 kilometers. For us the break in period for the gearbox to run smoothly was around 1000 kilometers, contrary to the 500 that Pinion mentions. We could feel the teeth running more smoothly every day, while gears 1, 2 and 17, 18 took a bit longer, probably because we don’t use these often enough. At this point we found the gearbox much smoother and more silent than the Rohloff and were falling in love with the system. Shifting is direct and easy with changing multiple gears at the same time. It is silent and we feel absolutely no resistance. 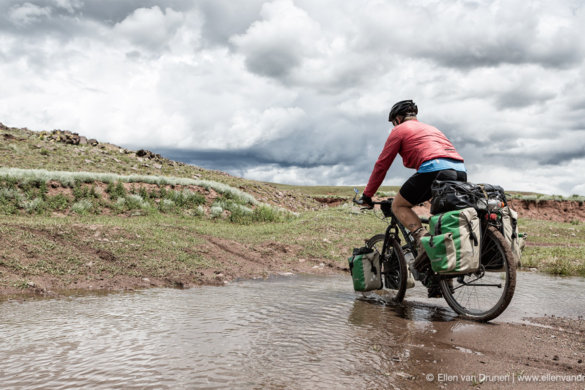 But after 1500 kilometers, Ellen started to have issues with the cranks: ticking and creaking with every kick. We dismounted the cranks to discover they already had worn out. The same thing happened to my cranks, but after about 2000 kilometers. This probably has to do with the fact that my pedal frequency is a lot higher than Ellen’s. In both cases Pinion sent us new cranks and the second pair were the CNC milled ALU cranks instead of the Forged ALU cranks we had initially. While we waited for the cranks, we could keep going as we shifted the cranks a quarter turn, so the issues with the cranks were no direct show stopper, just annoying. 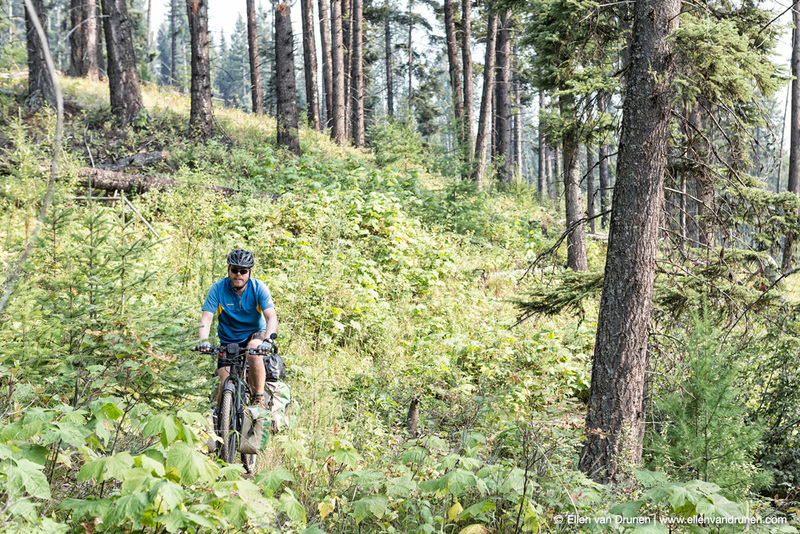 Happy with our new cranks we continued our smooth and silent ride crossing the United States on the Great Divide Mountain Bike Route. But again, after about 6000 kilometers the ticking in Ellen’s cranks returned. This time it’s not a continuous ticking and creaking, but an irregular sound. We think it has to do with weather conditions; temperature and humidity seem to influence the amount / presence of ticking and creaking. Some days it’s gone, some days it’s there. I guess the cranks are a point of attention for Pinion and need improvement. Right about the same time my front sprocket came loose, even though it was tightened at the required amount of torque and a local bicycle mechanic came to the rescue. Apart from the irregular ticking in Ellen’s cranks, both boxes are performing very well and we have not had new issues with the system. 8500 plus kilometers on the odometers and still going strong. So, in short, the gearbox itself is performing as expected, but we experience that the accessories, especially the cranks, do have start-up problems. Note: in the mean time Gates has introduced a new and improved Centre Track system which is not mounted on our bikes at the moment. Maybe I get the chance to test that in the future and maybe that is the improvement I’ve been looking for. And someting to keep in mind: don’t tension the CDX as much, it’s not necessary at all and will improve your riding experience. The way the gearbox itself performs is something we both got used to very easily and it definitely has advantages over the Rohloff hub: it’s silent and smooth, we feel no resistance in any gear, the steps are smaller and the range is wider. But the Pinion still has one start-up problem that needs improvement; the cranks. Would I prefer the Pinion over the Rohloff? If money was no object and with improved cranks I’d certainly say yes. Is it necessary? Not really. The Rohloff has been a loyal partner for more than 20.000 kilometers and we have been able to cycle anywhere we wanted in any condition. But the Pinion does have its advantages over the Rohloff. Is it worth the money? That’s totally up to you, I don’t know the value of money for you and that is something you have to decide for yourself. If you have any questions or remarks, please comment below! CONCLUSION: The way the gearbox itself performs is something we both got used to very easily and it definitely has advantages over the Rohloff hub: it’s silent and smooth, we feel no resistance in any gear, the steps are smaller and the range is wider. But the Pinion still has one start-up problem that needs improvement; the cranks. Would I prefer the Pinion over the Rohloff? If money was no object and with improved cranks I’d certainly say yes. Is it necessary? Not really. The Rohloff has been a loyal partner for more than 20.000 kilometers and we have been able to cycle anywhere we wanted in any condition. But the Pinion does have its advantages over the Rohloff. Is it worth the money? That’s totally up to you, I don’t know the value of money for you and that is something you have to decide for yourself. Mooie vergelijking. Ik dacht alleen dat de roloff pas na 10.000 km of 1 jaar olie verversing nodig heeft. Thanks for the review! Despite your cranking problems, I have great hope that they will overcome them soon enough. Wat een uitgebreid technisch verhaal. Fantastisch. Specially designed frame? Irregular clicking? No matter how you try to honey it up those two things condemn this product to laughably inconceivable. Richard, a specially designed frame is not a flaw of the system, it’s just something you have to consider. I agree with the creaking of the cranks, which is something that needs improvement in our opinion, because no matter what, it’s part of the whole system. But, it’s something they should be able to overcome. We are not honeying things up by the way; because it really is a nice system and we like cycling with it, that’s our personal opinion and experience. Verdraaid interessant verslag gelardeerd met technische gegevens. Zeer opmerkelijk dat naast dit ingenieuze, high tech speeltje zoiets schijnbaar simpels als een cranck snel problemen oplevert. Dankjewel Peter voor je reactie. Het is inderdaad jammer, maar ik vertrouw erop dat ze het probleem oplossen. Het blijft natuurlijk een persoonlijke ervaring, misschien dat anderen er helemaal geen last van hebben. If they don’t figure it out (and I’m pretty sure they will), there is still the Rohloff which, all said and done, is still a very good system. I would really like to see that price comparison article for the three systems (derailleur, Rolhof and Pinion), especially if you could factor in on-going maintenance costs (chain/belt replacement, cog/cassette/chainring replacement, oil, etc.). Hi Stephen, we are working on such an article! Tikje (…) laat maar toch nog. Kun je iets beter aangeven wat er aan die cranks mankeerde? Het zijn delen die stilstaan t.o.v . andere delen dus dat “worn out” begrijp ik niet. En de tanden waren het ook niet omdat je verder kon door ze versprongen te hermonteren. Hebben ze een smal raakvlak op de trapas waardoor ze jouw trapkracht niet aankunnen en kantelen cq loswerken? Hi, I just got a Tout Terrain Tanami Xplore and although I only have about 200 miles on it I’m really liking it. My previous bike had a Shimano Alfine 7 speed hub and personally I doubt I’ll ever buy another bike with a derailer. BTW, Tout Terrain sells a few “last year” models on their website. Even with shipping and import fees into the US I saved a bundle and love the bike. Good luck with your new bike! Us too, won’t go back to a derailleur. Our next bike will have a Rohloff again. De tandjes aan de binnenkant van de crank slijten sneller dan de tanden op de as. Het lag waarschijnlijk aan een verkeerde frase-methode. pinion heeft nu ook geadviseerd dat de boutjes van de crank met 8NM (ipv 5nm) vast gezet moeten worden. wij hebben nog niet verder kunnen testen of het nu wel verholpen is. op het moment dat je de cranks een kwartslag draait, verander je het aangrijpmoment van aanzetten en dus ook de plek waar de cranks het meest versleten waren. Het is nu duidelijk. jullie waren dus idd te sterk haha. How did you find the gear spacing, I’ve been looking at the P18 v P12 and the P12 looks adequate for touring. With the even %age spaces I wonder if both the P18 and Rohloff are just too close together. Also were you given any weight limitations? All I can glean from Pinion is a 110kg rider limit including backpack. Tout Terrain mention a 140kg limit including luggage. These seem quite conservative, particularly for a big guy on a long tour. I’m not sure about a weight limit, I’m not a world traveler. I do find myself skipping gears up shifting and down. I commute with a lot of hills so I’m ok with the extra gears. The gear spacing of the P18 is very small, so there’s always the right gear to cycle in. We found that an advantage over the Rohloff. For serious touring the P18 is more suitable than the P12 in case you carry luggage. 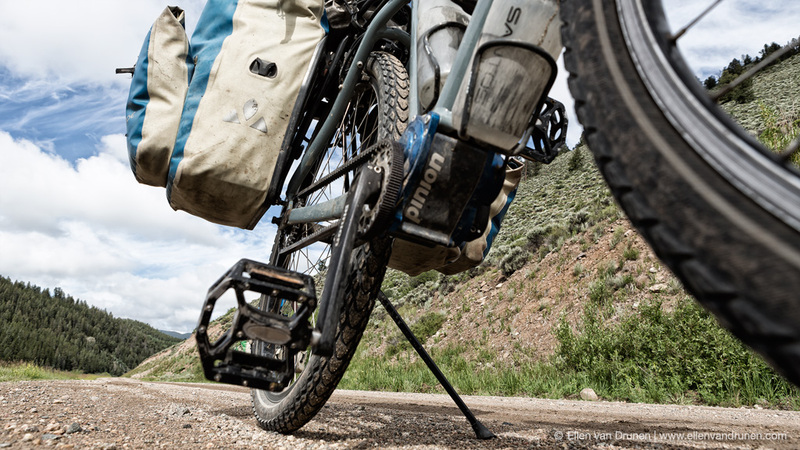 For very light bikepacking you might consider the P12. About the weight limitations; in the manual it is said that the limit is 110kg including rider and luggage, whcih is not enough for a 80kg guy. I asked Pinion about this and the answer was that we should not worry, they have put the weight limit mostly for serious mountain bikers who jump all over the place. I (Elmar) did carry more than 110kg in total and didn’t have the feeling the Pinion was troubled by this. Since all the issues we experienced also happened to Ellen’s Pinion box with less than 110kg. Hi Mark, I’m curious.. how is your Pinion box performing? Any troubles with the cranks? Pinion has changed the way the cranks are milled, I hope that solves the problem. I only have about 350 miles on the bike so far. At about 300 one of the crank arms fell off while I was riding. I put it back on and it’s been ok. I contacted Tout Terrain and they basically said it was my fault for not checking if it was tight. Not happy about that, I don’t know who installed them. Other than that it’s been good. I got a great deal buying from TT but if I’d payed full price is be pretty pissed. Time will tell I guess. it is normal to have to tighten the left crankarm bolt, monthly, as it becomes loose by design. Left crank turning counter clockwise constantly turns the bolt to the left also , making it looser. So, take it out ; wrap threads with thread-locker tape ; install ; ride 6 months without it able to come loose. I would be pretty pissed too… things like that should not happen and TT shouldn’t blame you, especially since it happened after only 300m. Well, good luck and keep us posted! Once a year or 10.000km is whats recommended for the oil, so for me, it’ll be once a year and I’ll do it at home LOL.I hope the crank problem is fixed also but in my case I think someone just messed up torquing the bolts. This year I have a 2 week, about 600 mile trip planned. If that goes well then maybe next year the I’d like to ride across the U.S.A. All the torque specs along with service videos are on the Pinion website. Hi Sciphot, you are welcome! In the end we rode about 10.000 kilometers with the Pinion and we changed the oil, just to see how it works (it’s not necessary) and it was really simpel. For our Rohloffs (we cycled almost 22.000km with those in this trip) we brought some oil along and changed it on the way. That’s a little disappointing. I had big hopes for that. I guess, if I do lean towards non-deraileur, I’ll be going Rohloff. I feel like I’m kinda stuck now.Hoping to get new cranks from somebody. Many thanks for the previous reply and for having the best article on the Pinion I’ve been able to find. I was wondering if you knew of any other resources worth looking at in respect of the Pinion. Not the standard sort of review stuff as I’ve looked at them and none of them come close to this. But are there any really technical ones, maybe where they strip and rebuild, etc? I’d also be interested in any forward looking technical info, as in ideas about where this style of bicycle gearing may head. Derailleur/Rohloff/Pinion/Alfine efficiency comparisons, how light could they make a BB gearbox? Is there a chance the Pinion bridge plate could become a standard like a traditional BB shell did? The online magazine fahrradzukunft.de has published data on efficiency, they show, that Rohloff is about 3 – 4 % better than pinion. So an update on my Pinion cranks. I didn’t realize that there was a center shaft bolt that held the cranks on, which means that the 1st time it fell off the bolt was lost. After I put it back on it was just a matter of time till it fell off again. I sent a rather lengthy email to Tout Terrain and Pinion stating my unhappiness with them both. No one tried to figure out what happened, just “put it back on and tighten it”. Pinion is now sending me 2 new cranks with new bolts so I am happy about that. I think I have the forged cranks and I asked them to send me the CNC cranks so we’ll see. so, just an update. Today I received 2 new cnc cranks and bolts from Pinion. Turns out my old ones were the forged.I’m awaiting some assembly paste and Loctite that Pinion recommends for installation. To Pinions credit, they sent me the cranks without hesitation and got them to me quickly. Hopefully this will end this and I’ll be able to get back to th riding my bike. Mark, good to hear you received the new cranks and that Pinion provided the service in the end. Now let’s hope they really have resolved the issue, since it costs a lot of money and things like this don’t give a lot of confidence. Keep us updated on the issue! Thanks! Hey thanks for posting this review. It’s difficult to find content like this on the Pinion system. 1. Is it light action? Say, compared to the shifter on the Rohloff hub, how does it actually feel at the hand to shift? 2. I’ve noticed that the numbers on the shifter go right the way around the barrel, so to shift from 1st to 18th would require rotating the shifter almost 360 degrees which would take multiple twists of the wrist. Has anyone experienced this as an issue or is it quick enough to achieve a dramatic change in gearing? For the first time, I’m planning to buy a worthy World Traveler (Santos), and I’m having a lot of trouble deciding between the Rohloff hub and the newer Pinion system. I’m leaning towards the Rohloff because it has proven itself countless times over, and the Pinion is more or less unknown territory for me. Price is also an option, here in The Netherlands a Pinion drive would cost exactly 1000 euros more than a Rohloff hub. I can spare the money, but only if I get a proven product. I also throw warranty in the mix. Here, the “unproven” Pinion went from 2 years warranty when it came out, to the current 5. This seems a lot compared to the 2 years of the Rohloff, BUT, here in The Netherlands, the importer for Rohloff guaranties LIFE LONG guaranty, if the oil in the hub is changed once a year, or every 5000 kilometers (Rohloff can “read” that information from the hub). So that is life-long on a proven product, versus 5 on an unknown one. Your article did help a bit, but I’ll probably be milling it over for a few days before I make the decision. If I may, I also have a question? If you had the choice between Magura HS33 V-brakes, or Shimano XT disc-brakes, what would you choose, purely on personal experience? On my last bike (Koga Custom Made) I had a lot of trouble with my disc-brakes (squeaking like a tortured mouse), but they where of inferior quality to the XT disc-brakes. To answer your questions; I find the shifting similar to Rohloff. Quick turning and shifting between multiple gears. My first question would be: for what purpose are you buying the bike? Commuting? Travelling? Both? Long distance rides? Overseas? The Pinion drive system in The Netherlands will set you back almost another 1000 Euros, but I don’t know the value of money for you personally. Test ride the bike and feel both systems before you make a decision. The Rohloff guaranty might be LIFE LONG, but the warranty isn’t. After 2 years have passed, you will have to pay a fee in any case the Rohloff needs maintenance. You can always come and visit us at Bike4travel in Rotterdam, we can show you a couple of different Pinion bikes, you can test ride them and we’ll tell you more about brakes and stuff. And let us know your what you have decided to buy! So I am not alone. The creaking and clicking is starting to get to me. Just one more question for pinion p1.18 users, I have this on a tout terrain, nice bike, but no one ever seems to mention the delayed uptake click when starting from rest or when coasting starting to pedle again, there is a small gap between gear connect and drive connect. Is this everyone’s experience? I think I need to change cranks too. My left hand crank has literally fallen off twice (1) once becaus when I picked up the bike no crank centre bolt was in place the second time? Incredible that a bike can be designed that actually unscrews a crank centre bolt? What is wrong with a left handed thread. Sorry to hear you have the same issues with the cranks. Make sure Pinion replaces them with the new ones. I do recognize the delayed uptake click; but I believe that that particular characteristic works as designed. And I also agree about the thread, we didn’t understand that either. 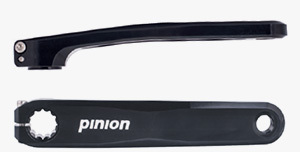 I’m curious to hear if Pinion will send you good replacement cranks, let us know! I had one of my cranks fall off twice. After the 2nd time I realized that the center bolt was missing. I sent a detailed and not so nice letter to Pinion and TT and told them I wanted new cranks. Pinion didn’t blink and just wanted to know what size I had. I have had them on for a few hundred miles now and have had no problems. I think it originally was an assembly issue. Pinion now recommends using carbon/alloy assembly paste on the cranks on the crank spline and LocTite on the bolts. I did that with my new cranks and so far so good.I have about 900 miles on mine now and it is starting to loosen up nicely.I can shift between several gears at a time which can be useful on hills.I agree there is sometimes a gap when shifting gears but I’m getting used to it and am really enjoying my bike. Yes have contacted seller and will contact pinion directly. Because these bikes and gear system are still rare in UK it is difficult to find anyone else to discuss these concerns. You start to become a bit neurotic about ‘am i paying too much attention to the noise?’ ‘maybe its supposed to do that?’ It is like reading an agony aunt page and realising you are not the only one. Looking forward to a happier future now …. assuming the cranks do the job. Thanks again for the ‘lived experience’ with the pinion. Very interesting review thanks. Nice that you rode it lots before writing. I have ridden rohloff and it is certainly nicer than derailleur, but I think that both Rohloff and Pinion are solutions to a non-existent problem. Even regular Deore transmission will give years of good service, all the bits are cheap and widely available. The main advantage of Rohloff and Pinion is that you do not need a dished rear wheel, but Rohloff rather mitigate this by not selling a 36 spoke hub. I guess that is one up for Pinion. Me I am sticking with the cheap stuff I can fix and replace completely myself! Hallo Jan and greetings from sicily. I just bike here from Munich, 2000km. A great tour! I used a Pinion 1.12 with a cdx belt on a bike that was built for me. I LOVE the Pinion (and yes, I also had problems with the cranks). BUT the real issue is the Hub. I use a cassette Hub with spacers. No good… I need a singlespeed in silver without the attachments for disc brakes. And not crazy noisy… The perfekt Pinion Hub! Do you have an idea? Would be great to hear from you! Cranks arrived today. So hope this helps. Will let you know. Thanks for the review. Thinking of a long-distance titanium bike with either Ultegra triple chain rings and Ultegra rear derailleur, or belt drive with Rohloff hub, or belt vs chain drive with Pinion transmission. Guess I will wait for someone to do the 3-way comparison you talked about. My question is whether you know of a Pinion distributor or frame builder who would incorporate the Pinion transmission in the U.S.? This is not about non-existent problems! I’ve been riding my pinion bike for one year on tours, for grocery shopping and weekend joyrides in the woods and country. In mud and snow with an outside temperature at around freezing point, when the space between the rear sprockets of derailleur systems quickly clogs up, Pinion just pulls through unimpressed even when the chain tensioner is frozen fixed in its position. Being able to change gears quickly at traffic lights while standing or when the bike is heavily loaded on tours is not an issue. The low gears of the P1.18 give you a real advantage over derailleur systems on tours with plenty of luggage and inclines of more than 15%. The higher system weight is easily compensated. Since cleaning the drive train is done so quickly I am less reluctant cleaning the bike, which leads to an even better overall performance. All the above just makes it a superior bike to me compared to the previous derailleur I had. – I don’t want to go back to 3×10 or other. I’ve had my Pinion 1.12 on a made-to-measure Titanium frame MTB for just over two months now (MSG Bikes in Lancing, Sussex did the build). I had the (650B) wheels built up using the Hope singlespeed rear hub, which works extremely well with the Gates carbon drive I specified. It’s been a miserable wet late Spring and early Summer here in the UK, so I’ve been shipping a lot of water and mud without any problems. The weight differential of the Pinion box means the bike isn’t superlight, but it handles extremely well, with the gearbox weight nicely centered. A huge advantage on an MTB is the ability to change to/from any gear rapidly on encountering unexpected gradient changes – no more crashing cogs and chain drops, and no more bent rear mechs from hitting rocks and stumps. The only issue I’ve experienced is some loss of tension in the drive belt over time – I’ve twice retensioned, but don’t know why; Gates belts aren’t supposed to stretch and I can’t see how the rear dropouts could be slipping forwards. But that has been the ONLY maintenance I’ve had to do. So far, so very good; hoping all continues as well. Nice to read you review. I too have graunching cranks. Furthermore my gears occasionally drop out with a loud report like a pistol shot. It only happens pedalling up long steep hills. Pinion have dismissed the graunching as a wrongly tensioned belt. I think they’re mistaken. They haven’t answered my request for advice about the gears dropping out. But they’ve asked me to get my dealer to send them back the whole thing because it’s leaking oil. I’ve only had it three months. I’m very pleased with it – or I would be – but for the problems. I’m just hoping their customer service lives up to their product profile! I’ve got a few hitches to deal with though. Up a long steep hill there’s an occasional instantaneous disengagement of the transmission, simultaneous with a loud “snap” like a pistol shot. If I were stood on the pedals (I never do) it would make me fall off. This has occurred from day one and I’m only now getting round to raising it with the manufacturer. It sounds and feels as if a pawl jumps the tooth of a ratchet. I was prompted to contact Pinion because two additional faults have occurred over the past fortnight. There’s a film of oil appeared on the sprocket side – so there’s a leak. And there’s a graunching noise and a sensation I’d associate with crank / shaft attachment (anybody with bits of cartilage loose in the knee will know what I mean by graunching!) I’ve checked the torque on the bolts clamping the cranks to the shaft – they’re not loose. Pinion replied: they blame the crank noise on belt tension. This can’t be right cos it started with only the right pedal stroke. They’ve told me to get the gearbox back to my dealer and sent back to Germany to deal with the oil leak. They don’t seem to address the occasional “snap” with instantaneous transmission disengagement. Apologies if my previous post here was unduly negative. I am interested in the engineering problems of trying to improve on traditional bicycle transmissions, and am still skeptical about Rohloff and Pinion under general conditions. Time will tell! I am just wondering whether the various problems reported here and elsewhere with the Pinion cranks making a noise are actually more to do with the entire pinion gearbox moving slightly inside the rather large eqivalent of the BB shell in Pinion specific frames? This would also make a noise when you stand hard on the cranks. Certainly with a traditional BB assembly noise from down there is often a symptom of the BB being lose or BB bearing issues. I would love to know who to contact about buying the gearbox kit. I sent pinion a mail but no answer, maybe no ones attending their email? Ben, true. We’ve been thinking about that too. But for us, it was definitely the cranks and the slipping of the gears inside. When we took the cranks off, you could easily see the wear and tear and replacing them resolved the issue with the creaking sounds. Thank you for your corroboration. My dealer wasn’t able to reproduce the “snap” when he rode it for a few minutes before dispatching the gearbox back to the manufacturer. I gather that the response from Germany is still “it’s the customer’s fault for getting the belt tension wrong”. I only hope my retailer stands his ground on my behalf. No mention from Germany yet regarding my cranks. I admit I often ride with 20kg of luggage, and it’s mainly steep hills which provoke the crank graunching and the snap. Do the people at pinion HQ read this forum? You’re welcome. Well, we rode the Pinion with about 25-30kg of luggage and I (Elmar) weigh about 80kg. The belt shouldn’t be tensioned too much, but I doubt that’s causing the snap. If you can, (or your dealer) take off the cranks, you’ll notice quick enough if they are worn out. I have no idea if they read this thread, if they do, they are welcome to respond and give their sight of the story. Are only goal is to be honest and help improve things. I’m afraid not. I don’t understand their reluctance to sell to individuals and smaller bike builders. With the 5 year warranty it does show they have confidence in their product.. I suspect the problems posted here about gears slipping and cranks falling off, is both a design and quality control issue which by now you’d expect they’ve sorted. I’d be willing to try one out if I could get one. I only need the kit not a complete bike. Many thanks for the review junkies. I was wondering if you have noticed any change in riding behaviour and balance between the pinion and the rohloff due to the placement of the gearboxes (central for pinion, aft for rohloff)? Pinion is heavier but claims optimum center of gravity. Hi Joost, you are welcome! Hello Junkies, thanks for hosting the de-facto Pinion owners forum. I picked up a 9XR on a TT Via Veneto in Feb. I’m curious if anyone else has experienced the occasional grind and mitigated it. At first, I thought the grinds occurred from too much load during shifting; but I’m still getting them after habitually stopping the cranks for a shift. Pierce’s post make me suspect I’m sometimes spinning up the cranks too fast to get a solid engagement. You are welcome! We’ve been in contact with Pinion and I hope they will soon join the discussion. I’m not sure I know what you mean with the grind sound, when exactly do you hear the sound? Does it come from inside the box, the gears themselves? Maybe someone else can help you out, who has experienced the same? Anyone? Actually, I feel a grind with my feet more than I hear it. Sounds are usually muffled by the commute music I’m listening to. The grind is accompanied by a slippage inside the gearbox. I think the grind is equivalent to the snap you and William report. I first encountered it during climbs as well. Higher input torque could impart the impression of a continuous snap instead of a grind. Unfortunately, I just experienced the grind even in a low torque situation. Looking closer at Pinion’s design, I’m guessing some gear internal teeth are defective/ damaged and don’t fully engage the pawl. I’ll try to confirm this by localizing the effect to the particular gear. How often did you experience the snap/ ‘gear slightly off’ on the Pinion; and did it get worse, better, or stay consistent over time? Does Rohlhoff ever experience something similar? Hey, I thought I’d chime in here again. I initially had a problem with one of my cranks falling off. Pinion sent me 2 new cranks and I assembled them as Pinion recommends, using assy paste and LocTite.I don’t believe they were assembled correctly the 1st time. Since then I have had no issues with them and now have about 2100 miles on my bike. One thing I notice about shifting is I put a little pressure on my twist grip and a little less pressure on my pedals and it shifts great. It just kinda falls into gear. It took me a while to get used to, kinda like heel/toe driving with a stick shift. Also, now with over 2000 miles it has really loosened up and I couldn’t be happier. Hello there. My snap and momentary transmission failure is cured. It was as the chaps at Pinion suggested, a question of getting the belt tight enough. Their explanation: the torque amplification is upstream of the belt. This is peculiar to a bottom bracket gearbox, and so you can’t just tension the belt according to a generic Gates belt-tension guide. I’ve tuned the belt to a vibration of 50Hz, and no more snaps! I’d previously had it tuned to 35 Hz. I suggest a diagnostic test: raise and lower the tension and observe the respective effect on your grinding. Best of luck! Hello there. My crank graunching is cured. Like you Brian I’ve had replacement cranks from the chaps at Pinion. Isn’t it odd that this problem seems so simple to solve? It must likewise be easy to prevent. Thanks William, that appears to have been the issue. My belt tension was already around 40lbs, which is equivalent to 50Hz. Barely tightening the belt by a pound or two was just enough to stop the transmission drops. After a week of steadily increasing my demands, it is demonstrating its true potential. Of course, now I’ll need to follow the rest of the advice here and install the CNC cranks. I’m getting a lot of pinging after they were serviced. I’m about to take delivery of a titanium MTB with 1.18 Pinion and Gates Carbon belt. I was getting nervous about all the crank and gear crunching/snapping. But now, starting with W. Barwell’s comments saying that the belt tension cured the issue I’m much more excited about the arrival of my new bike. Question: I’ve never heard of adjusting a belt to 50Hz. Does one need special equipment to adjust a belt to a specific frequency? Perhaps when I get the bike and see the instructions this will be self evident. In the event this is NOT in the instructions, how does one adjust a belt to a specific frequency? Also, once the belt is adjusted properly, does it need periodic adjustment? 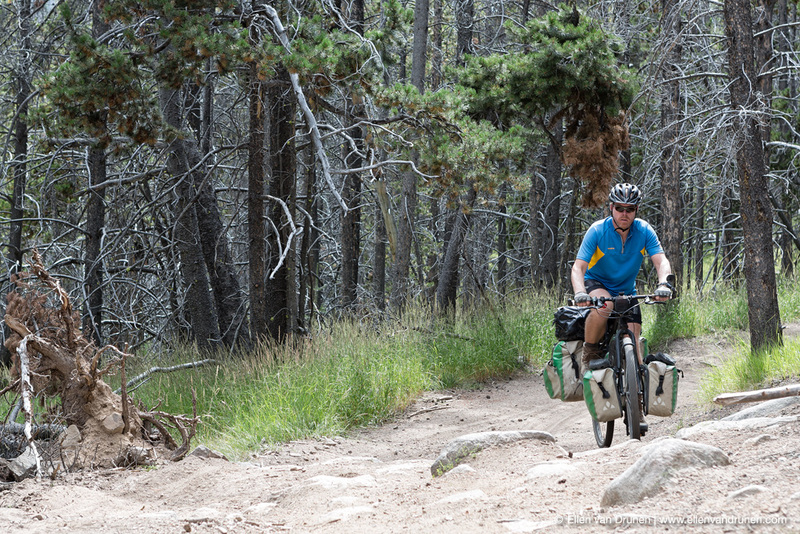 How did the Pinon compare to the Rohloff regarding shifting under load? Same? Allowed more load? Less? I suspect the belt may need periodic adjustment, if you use the perfect tension. While I’ve heard belts are not supposed to stretch, I suspect they still experience “chain-stretch” just to a much smaller degree. I didn’t experience transmission drops until several months of usage, which seemed to slowly get worse over time. Using a higher tension than is needed likely accelerates wear on, at least, the belt. However, its possible that the Pinion oil change is the most significant periodic event, in practice. The belt may easily tolerate a few extra pounds of tension to counteract a year of stretch without premature wear. And, I doubt the yearly oil change can be done without re-tensioning the belt. I am using the Rohloff – Gates Carbon CDC-belt combination since 2011 (three bikes: Santos TM, Santos Race Lite and a Van Nicholas Tuareg – about 41.000 km all together). A periodic adjustment of the belt tension was never needed. Re-tensioning a belt after an oil change? Never heard of? Special tool for measuring the tension? I use a weight of one kilogram and a simple ruler. The belt on the MTB has a bit less tension due the muddy conditions. In fact: the first belt on each bike is still in use, even after 27.000 kilometers (on the Santos TM) it is still performing as normal. I believe that my Pinion drive and cranks were not installed per manufacturer’s recommendations. Some minor click clunk when standing on pedals in lower gear. Will reinstall transmission, tightening bolts in correct sequence, with correct torque and goop, same with cranks. Is this the only spot on the internet to have practical discussion about this stuff? I haven’t found another forum yet. This one is tricky to deal with on a smart phone. My replacement cranks, carefully installed, no longer creak. But even with a tightened belt I still drop out of gear – the metallic snap and 180 degree give in transmission – every few miles on hills. The chaps at pinion initially convinced me this was the belt being loose enough to jump teeth over the chainring. But I think it’s actually something amiss in the box. The whole thing works like a dream otherwise so I’m just going to monitor the incidents and get back to the manufacturer if the problem escalates. Hi William– when you reinstalled your cranks, did you use “carbon assembly paste”? I have some, but I do wonder about intentionally assembling a metal to metal interface gritty grease! I have an email in to the Pinion folks, as to a recommendation for which goop, but no response yet. On a related topic– are you using the Gates app for measuring belt tension? So– I reinstalled the transmission and cranks per spec, and clunk went away. It does seem strange to me that the crank installation requires “carbon asssembly paste”. That seems like a bit of a kludge to me. I never did get a response from pinion as to what brand is best. I also have the “falling out of gear” issue that William Barwell references above. My next plans is to calibrate belt tension, using the Gates Iphone app. 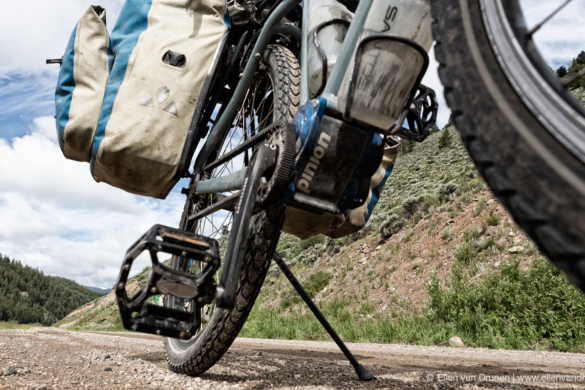 Interestingly, it seeems to me that the falling out of gear is NOT related to increased pressure on the pedals– it seems kind of random– and if anything more common when pedal pressure is light or intermittent. I can’t help but notice that most of the comments on here mention crank issues and the “falling out of gear” problem, yet many people still say they prefer the Pinion to the Rohloff. I would just like to know why? Has anyone experienced any issues with the Rohloff and is it really that much harder to shift than the Pinion? I have read countless articles, forums and reviews about the Rohloff and they all mention it’s great reliability, lighter weight and ease of use. Are there some issues with it that I have missed that would make people want to choose the Pinion instead? Hi Steven- I never had any issues with my Rohloff. Advantages of the Pinion: wider range, easier to change rear wheel, seems to have a better oil seal (my rohloff always leaked a little), weight in a better location on the bike, claimed to be more mechanically efficient. I suggest you test ride both systems. My personal comparison experience is that the Pinion gearbox does not give me the feeling of having to put in an extra effort due do internal gearbox friction (now, how subjective is this? 😉 ). Moreover you do not only have more gears but the gears are also closer to each other thus even with a heavily loaded bike you always(!) have the right gear; on long tours this is a big advantage. And as already explained by Vincent, dependent on the sprockets used you have lower gears and higher gears than on the Rohloff. I’ve got my bike for 1.5 years and couldn’t be happier. My scenario is more niche, as my bike is electric. The 9XR gear ratio and ability to motorize the rear wheel are substantial benefits over the Rohloff. Thank you for the excellent article and also inviting others to contribute with their comments. This seems the de facto place on the web for experienced Pinion information. I want to purchase a bike with an internal hub, but, am not sure which one to get, Rohloff or Pinion. I will be touring for weeks on Rail-Trails and gravel roads pulling a 70 pound Bob single wheel trailer. With a heavy load, I really like the idea to be able to shift when stopped. The Pinion does seem relatively new with some problems. Whereas the Rohloff seems to have a slight, constant oil leak when laying down the bike for extended periods. Since you have extensive experience with both the Rohloff and Pinion, I noticed you mentioned your next bike will have a Rohloff. Is the Rohloff better or is the Pinion worse? I would appreciate your thoughts and reasoning as to why you will get the Rohloff next. Oil leaks aren’t so terrible as one might believe. By the end of this month I am attending a Rohloff course, to learn more about the system. I am in the process of buying two new Hase Kettwiesel EVO’s, both US Stock, full suspension, none folding frame, Nexus 8-speed rear, Schlumpf High-Speed front. For recumbent riders (and my curiosity) I’m buying a spare front boom, having a shop install the mount for a Pinion P1.18. I’ll then have my cycle shop install the four leg spider for the chainring, strip out the Nexus 8, and match a rear gear, on one of the trikes. I’ll be going with chain drive, not belt, since no belt drives are made long enough for a recumbent, and the boom chain adjustment system is already on the trike. Why all this trouble? Research, plus development of a possible Kit for a Kettwiesel upgrade to Pinion, if there becomes any interest once I post my findings. It is understood that changing the chainring on the four leg spider will be easy, but doing so on the rear will be a bit of a pain, since my trikes will have the Hase differential. I’ll be working with my dealer/shop closely in finding that perfect set of gears for the trike, its smaller tires, local terrain, and my riding style. I will be comparing the two trikes in mainly daily commutes (Approximately 50 miles a day), and weekend rides. I’ll also be watching for that Creak mentioned in your review, since my power angle will be much lower applied to the transmission case than a diamond frame, and attention to shifting because of the longer cables required to reach the twist shifter on the trike. Look for further information on my Facebook page. Vandaag mijn Santos fiets met Pinion binnengeleverd voor herstelling omwille van speling op de as van de Pinion zelf. 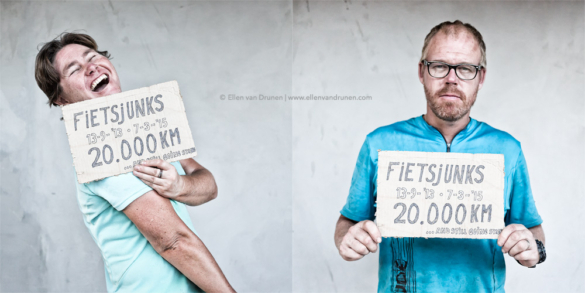 9 maanden oud, 6200 km. Zijn er nog mensen die deze problemen kennen? Luc has an issue with his Pinion hub, 9 months old, 6200 kilometers: playing on the axes. The Pinion has to be returned, Luc wants to know if anyone of you recognizes this problem. Informative articles on your site. Interesting comments on the Hilleberg. Last week our Nallo 3 GT started to leak from the seams after 12 hours of fairly constant rain and condensation the following day resulted in an impressive puddle at the foot of our bedding. Thought Nammatj 3 GT may be a more robust option but seems it would have the same problems, so may reconsider accommodation. We bought Santos Travel Lines (Rohloff and Gates belt drives) three years ago and have clocked up almost 10,000 Kms from summer cycle tours. Really reliable bikes which suit our type of travelling. As you had a long term stint with Santos Travel Lites, can you provide any tips on general maintenance and recommended replacement of specific parts after several long haul trips: e.g. replacement of eccentric bottom bracket, gear cabling, gear shifters… ? We live in the Middle East, so unless we plan an expensive stopover via the Netherlands, Santos maintenance shops are not an option. How is the pinion gearbox evolving since the article came out in november 2015? Are the problems mentioned above solved now? In the shop we work in (Bike4travel) we have sold multiple travel bicycles with Pinion drive system (Santos, Avaghon, Idworx) and none of them returned with crank issues, or whatever issues for that matter. So, from my point of view I think it’s safe to say Pinion has improved their cranks. Excellent Article. Enjoyed reading all the comments too. I live in Canada, and I don’t think the Pinion is available here on any bike. I know that in the USA, Co-Motion Bikes sells a few models for those who are into Bicycle Touring. I am curious if there are others too.. I wouldn’t mind having one as a normal Road Bike…. The ones sold by Co-Motion are all handmade bikes and are quite expensive (~ US$7,000). The concept of the pinion gearing system is quite innovative… Hopefully, the price comes down a little so the mainstream market picks it up. ENJOY! Very nice info here. I appreciate it. Has anyone tried the new Pinion C-Line gear box ? Any opinions and comparisons to standard Pinion P-Line ? Thanks Zhivko. No experience with the C-line yet, we do sell E-bikes with the P1.12 system, but I wouldn’t recommend that for normal touring bikes. The steps between the gears are too big to ride comfortably. I mostly ride mtb Enduro and in the city. I live in Sofia, Bulgaria. I consider one with Pinion as a city bike. I ride lots of kilometers in the town – around 6000 per year. On conventional derailleur based gear system I change my chain rings at about 2 years. I know that I totally do not need Pinion based city bike. It can not bring me the money back that I will give for it, not even a part of them. Well changing my sprockets and even my derailleur on the city bike costs me below 200 euro and I ride 11000 km with one set of sprockets – front and rear. So for 100 000 km if Pinion is working flawless, it will bring me back around 2000 euro, which is far less than the price of a Pinion based bike. I really doubt the system will go 100 000 without any problems (not even the belt). On the other hand this is too much ride to think about it. 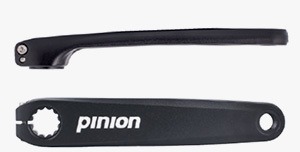 But I really like the tech behind Pinion. I just want to have one to ride it in the city or in the areas around. This is why I consider the Pinion C-12 system. And even more on the Pinion’s site is written for some improvements on it. William: we have the snapping problem too. We’ve got two Poison Bike Ozon with a P1.18. They ride fine, but on the Pinion of my wife’s bike the snapping, the jumping of a tooth within the Pinion, was so severe and frequent is every gear, that we received a new gearbox. We went back to Nickenich, and after the mechanics adjusted everything according to the numbers Pinion give, we made a test ride. To the end of the street, with two more snaps/clack!s. Poison Bike installed a new P1.8. Now the gear just clack!s now and then in a long ascend. My P1.18 leaked oil like my Rohloff does. This was so apparent that Poison Bikes swapped the gearbox without a lot of arguing. So the statement that a Pinion can’t leak oil is utter nonsense. *Every* bolted container can leak oil. Do not fool yourself! The Gates CDX performs very well, when it starts to sound like the cheap chain, we just spray some water over it, preferably brush it. With a bit of silicon spray on the belt the squeaking stays away a considerable time. At least a day of three. 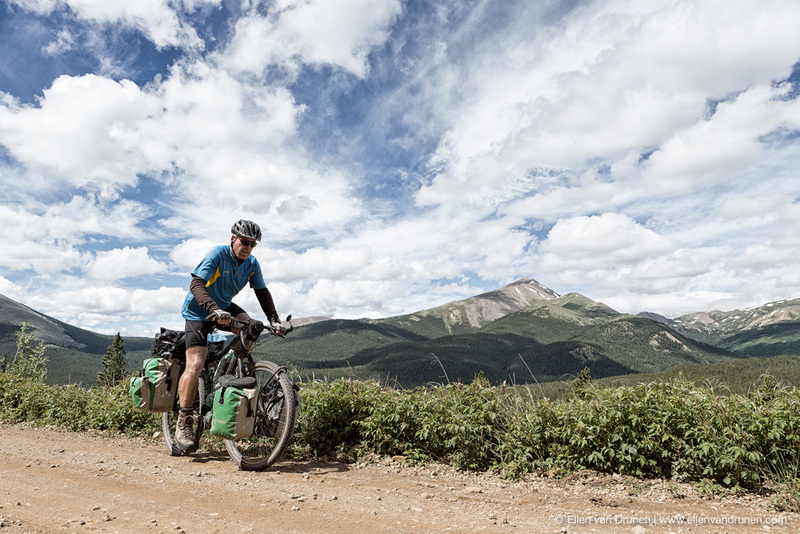 If you don’t ride too much sandy roads…. We have Rohloff bikes too and I’m convinced Rohloff is tougher than Pinion. All the Rohloffs (five) we have in the vicinity leak oil, some more than others. Big advantage of Rohloff is the connection of the gear cable to the outer box. It’s simple and intuitive, something the connection of the Pinion gear cable certainly is not! I had to change the cable due to a assembly fault of Poison Bikes. Fortunately I was near Waimate, New Zealand, when my cable jammed. I had the use of the workshop there and spilled four gear cables before I got the thing right (with the help of YouTube!). The splendid Porsche engineers should have looked to Rohloff for this. Both Rohloff and Pinion ride fine, shift the same. One strength of Rohloff is that they make only one very good product, and one weakness IMHO of Pinion is that they try to introduce a new product every year. They want to expand too fast. As an experienced owner of Rohloff and Pinion, which would you recommend? I’m having a custom touring bike built and can go either direction. I currently use a Rohloff but the extra gear range of the Pinion is very tempting. Mac, both Pinion and Rohloff have advantages, it depends on what you prefer. Pinion > more gears (P1.18), silent throughout all the gears. Wider range, smaller steps in between gears. But, heavier and more expensive to buy. We are currently riding with Rohloff, with the right sprocket combination I have enough range in the lower gears to ride up steep mountains. Why we went back to Rohloff? Weight and price. Transmission Pinion C1.12 Gearbox in comparison with the planetary (planetary hubs Rohloff Speedhub and Shimano Alfine SG-S705) transmission. Hi, I was meaning to update my comment. I was experiencing severe squeaking in my Pinion P1.18. I did all the routine checks: I already had a new CNC-crank (EN-AW 7075). Assembled the crank first with Cyclon Stay Fixed Montagegrease, when this didn’t work with anti-seizegrease. Nothing worked. I checked all the bolts, except the one that is unreachable under the chain ring. Nothing. I reached the point I wanted to give the bike to the Salvation Army. Instead, I brought the bike to Bongers Belt Bikes in Apeldoorn. They found the culprit. The one bolt I couldn’t reach was broken in two. The head was just fixed, but not connected anymore to the frame. Now I have six new standard and superior hex bolts to attach the P1.18 securely to the frame. My bike is silent again. @Mac: I’d go for Rohloff. Pinion is great, but too expensive. And as for maintenance in the field: neither can be fixed if the gearbox itself is broken, but that is something I gather that will be very highly extremely unlikely. But the cable, the shifterbox and the shifters of the Rohloff are more maintenance friendly. This is a point where Rohloff excels and Pinion leaves a lot to be desired. I had to change a shifter cable due to bad assembly, when on holiday in New Zealand. Luckily I was near Waimate and there was a friendly shop owner that let me use his workshop and wifi [for watching and re-re-re-watching the Youtube manual from Pinion how to change the cable]. I spent four or five cables [it was among others a bicycle shop] before I finally had the cable fixed. As for number of gears: I have another setup on a MTB: a Shimano Nexus 8 with two chain rings in front (with derailleur), so I have 16 gears. I plan to do this with my Rohloff MTB: using two chain rings very close together, you not only extend the total range of gearing (with two chain rings far apart you extend it a lot), but can have another gearing all along. I know this setup sounds crazy, but it works. To be sure it only works with a normal chain. And I use an old rear derailleur as chain tensioner: can be adjusted very precisely. Another advantage of Rohloff: as it is designed as an after market product for mountain bikes, if the gearbox goes to smithereens completely, you can always put in a normal wheel; every bike shop has normal wheels. No bike shop has anything from Pinion. I appreciate all this debate. I have 4 bicycles, all fitted with Shimano gear systems. Tired of all the maintenance, clusters, chains, issues in mud,snow, dry dust and rocky areas that threaten the drop out and rear derailer. After 30 plus years of riding bicycles, racing, doing mtb endurance races and road riding, I now confine my riding to doing mtb endurance riding and touring. The Rouloff and Pinion have been subjects of debate for many years, but I just have not taken the jump! Seriously considering the C1-12 for endurance mtb racing/riding. I am 80kg and load between 10 and 15kg to the bike. I ride dual suspension mtb’s, a single speed and a gravel bike. Any contributions to my choice would be appreciated. Hi Colin, I’ve got a Gilbertson Inferno fitted with a C12, I also got fed up with using a derailleur system in the winter. However, the Pinion hasn’t been trouble free. Firstly avoid Gates drive if you’re doing any kind of extreme mountain biking, I’ve snapped 2 belts and given it up as a bad job. They’re just not strong enough so I’ve switched to a single speed chain set-up. When I switched I went from a 32×28 on the belt to 24×26 on chain drive and this has also made the gearing more suitable for my style of riding. More worryingly my gearbox has just developed an oil leak, I’m waiting for Pinion to come back to me on it but it obviously doesn’t look good. At best I’m going to have to ship the box back to Germany for repair. The 5 year warranty is reassuring though. That apart, I’m still sold on the idea, the performance of the gearbox and the shifting are great in wet, muddy UK conditions, the weight is centrally located in the frame so the bike handles beautifully and it looks great. Hopefully this oil leak will be resolved as otherwise it’s going to be an expensive mistake. You are right, generally Pinion chain solution is more simple, more robust and more multifaceted in use. Longlife chain with Longlife 30/26 or 30/30 chainrings and chain tensioner is a most multipurpose solution. Verily, one bike for all purposes. Well, indeed I have to say that one of the greatest advantages of the Pinion is that you can change wheels at a relatively low cost: with the Pinion you can have the simplest wheels of all: no cassette or expensive Rohloff to consider. I have just converted my Rohoff-Mountain Bike to tubeless (with CushCore), but had to change the rims/spokes for the Rohloff. These are nice setups on the photo’s! Yes, I agree. 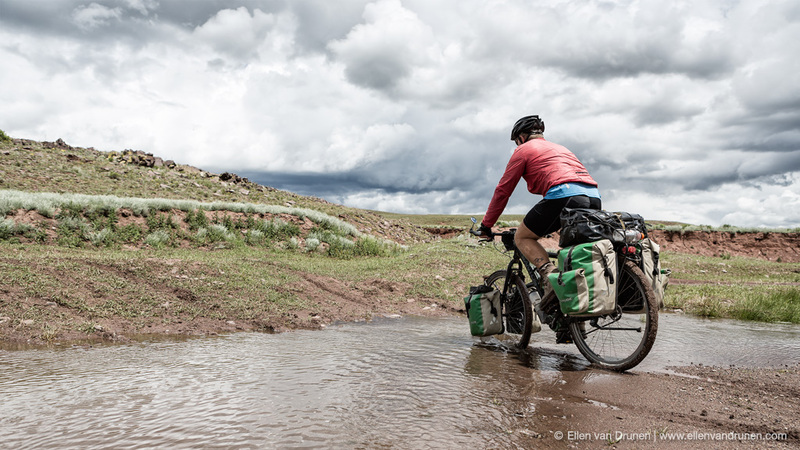 It possible to use almost any rear wheel, which is especially important during long way bike touring far from bike stores. Leonid, thanks for your input. Great looking bike. Definitely the business! Can you confirm which gearbox is being used? It is C1.12 on all photos. In my opinion the C1.12 Gearbox is optimal for any multipurpose bike (Super Versatile Bike).